Hello 2017! It’s been a while but we are back with some delicious and nutritious recipes to help you stay on track with your healthy New Years resolutions! What else is there to make when it’s freezing everywhere other than chili? Yes, usually the meat is on the fatty side and it’s normally paired with some sort of fat-inducing carb. But this recipe packs the protein and subs out the starch for a carotenoid rich squash. And, it’s topped with some cruncy kale because tortilla chips are certainly on no ones diet right now 😉. 1 bag of chopped kale. Juice of 1/2 lime. Directions: Dice veggies. Heat a skillet to medium heat. Brown veggies and then reduce heat. 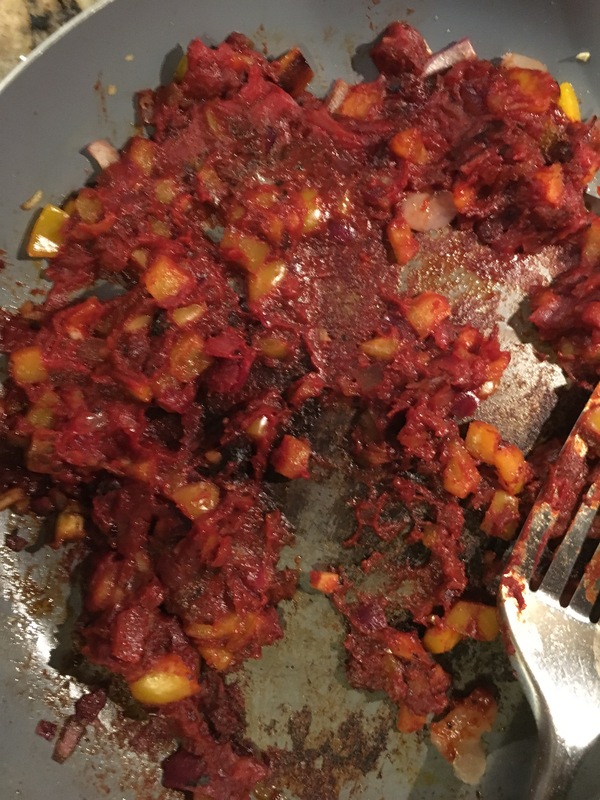 Stir in tomato paste, vinegar and agave. Add any hot spices you desire (cayenne, chipotle, cumin and black pepper used here). Mix until a cohesive paste. Lightly coat each chicken breast. 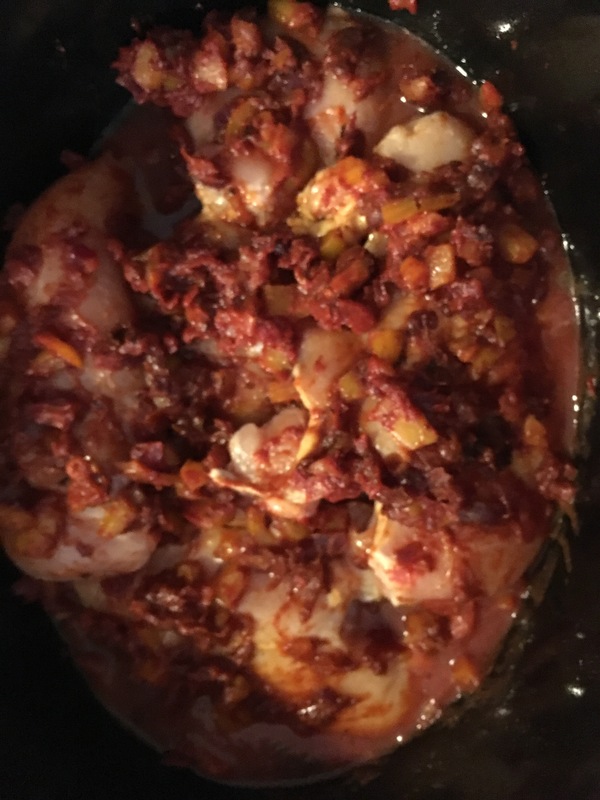 In a slow cooker, add 1/2 the can of diced tomatoes and 1/2 can of sauce. Add chili pepper and any other hot spices desired. Add both cans of beans. 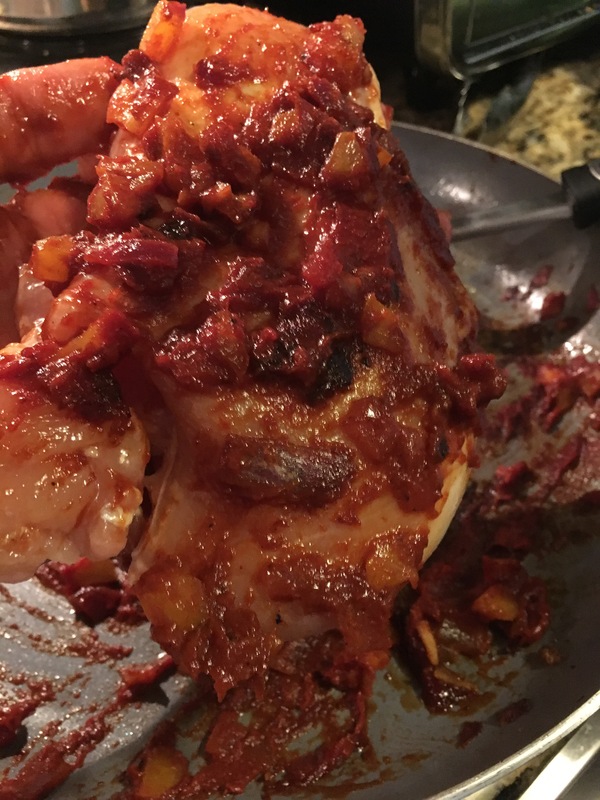 Place coated chicken on top. Add the remaining diced tomatoes and sauce. Cook on low heat for 4-5 hours. After about 2 hours, use a fork to break apart chicken. 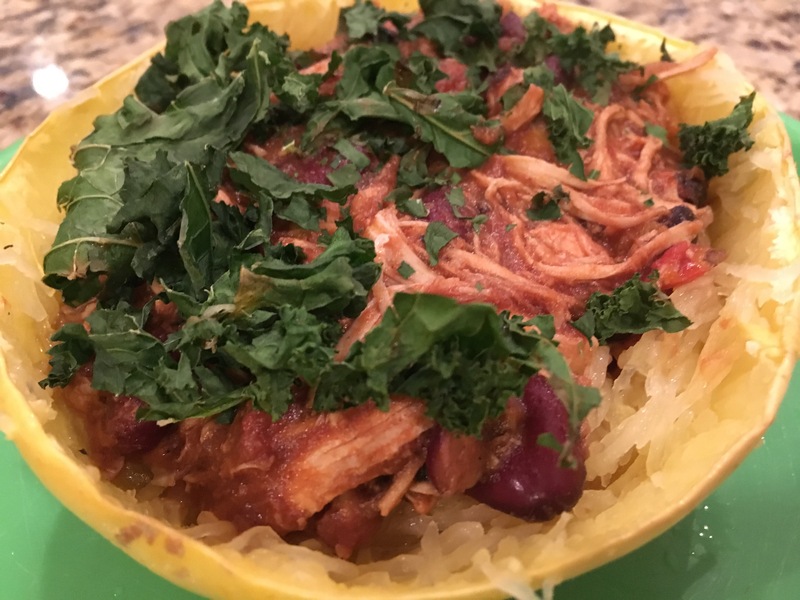 Refer here for instructions on cooking spaghetti squash. For the crunchy kale topping, spread the greens out on a cooking sheet. Drizzle lime juice over and sprinkle with cilantro if desired. This is just the thing to warm you up without costing you your diet. The squash serves as a great base that will make you forget all about that pasta. Of course, we couldn’t call the blog The Kale Box without a staple like kale chips. Many have complained that kale can never be as satisfying as a nice, crisp potato. And yes, there are few replacements for a good starchy carb. 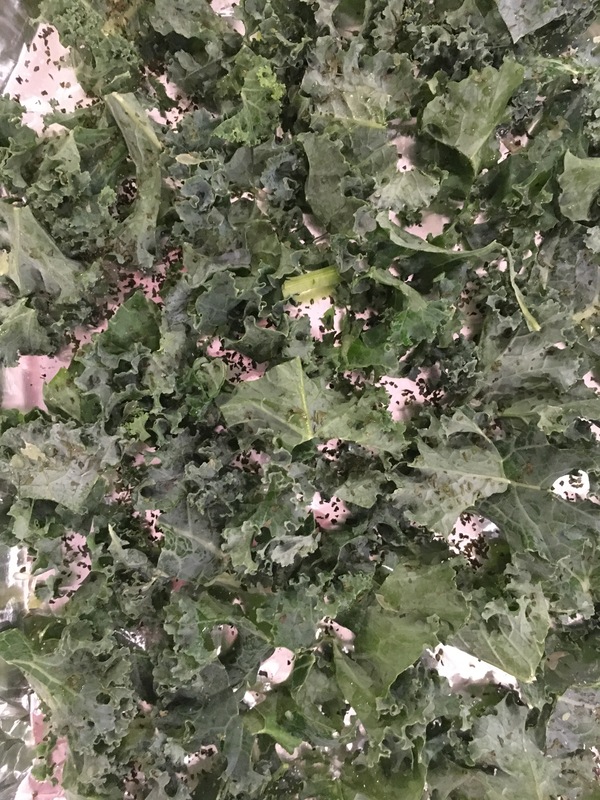 But the recipes below will expel the belief that kale chips are just bitter and brittle. First thing to know, not all kale is created equally when it comes to kale chips. While the traditional curly is always good for salads, the above photographed lacinto kale is best for chipping. Lacinto tends to be a bit sturdier and is more similar to a potato when it comes to texture. We’ve gone with a more Italian style with our seasonings. The top and far left chips have been flavored with olive oil and minced garlic while the remaining three are enhanced with balsamic vinegar, a bit of agave nectar to balance out the acidity, and chopped, red onion. Make sure to keep a close eye on your chips once they are in the oven! The chips will only need about 10-12 minutes at about 360°. You can broil for a few seconds to give an extra crisp, but make sure to be mindful! Happy snacking!